Have you watched the movie “Big Hero 6” before? If you have, you would agree with me that it was fantastic! If you have not, it’s okay! I just watched it during the NUS Alumni Family Day two weeks ago. One of the main protagonists in the movie named Hiro, was a gifted creator or robots. He had an older brother, Takeshi, who was as talented as Hero and attends the best robotic academy in town. Initially, Hiro built robots just for fighting purposes, but later, he was inspired by his brother to dream bigger and attend the so-called “nerd school”. In order to enter the nerd school, Hiro had to present his invention during the recruitment fair, and this is the part of the movie that I would love to share with you, let’s click on the link: https://www.youtube.com/watch?v=dSkuzg7YCo8. When I watched this part, Toastmasters was the first thing that crossed my mind. Notice that Hiro had a stage fright, and stuttered at first. The audience started to ignore him and left. However, after receiving encouragement from his loving brother and his friends, he presented stupendously and was offered a place in the academy! “How you say it” is as important as “What you say”. Hiro’s speech engaged the audiences’ senses. Notice that when he presented, he did not only tell the audience what “microbots” were, but also demonstrated to them how they work. The perfect combination of excellent speech crafting and choreography enchanted his audiences and caught an investor’s attention. Regardless of who we are, a scientist, an engineer, a social scientist, an artist, a businessperson, or even a musician, all of us need to communicate our ideas effectively. Often at times, we come up with breakthrough and brilliant ideas, but we have trouble connecting with our audiences and delivering the ideas to them. 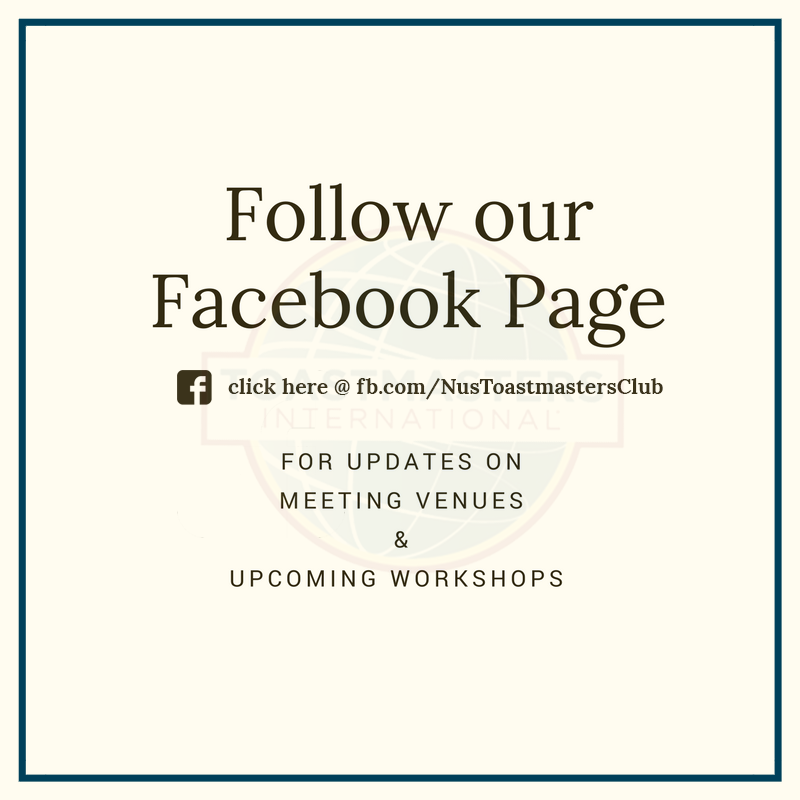 Here in NUS Toastmasters, we have an education structure that will help you build your confidence and competence in speaking, one step at a time. We have the basic 10 Projects in the Competent Communication Manual, from “The Ice Breaker” to “Inspire Your Audience”. After completing 10 basic projects, you can move on to select up to 6 from a palette of 15 Advanced Speech Manuals, each having its own specialisations, to further polish your speaking skills in different areas of expertise. Speaking in public may be scary, but the fear can be subdued with the support of your family and friends. In NUS Toastmasters, we are like a family. We encourage and motivate one another to improve, one step at a time. Navigate around our website to get a feel of who we are and what we do. Enjoy the educational resources written and posted by our dedicated members. If you have any query, or if you want to know how you can be a better speaker, listener, thinker and leader, we welcome you to contact any one of our Executive Committee members. Let us work together, Let us grow together, and together, let us achieve our dreams.